Air pollution that has turned the skies over Paris a murky yellow and shrouded much of Belgium for days forced drivers to slow down Friday and gave millions a free ride on public transportation. 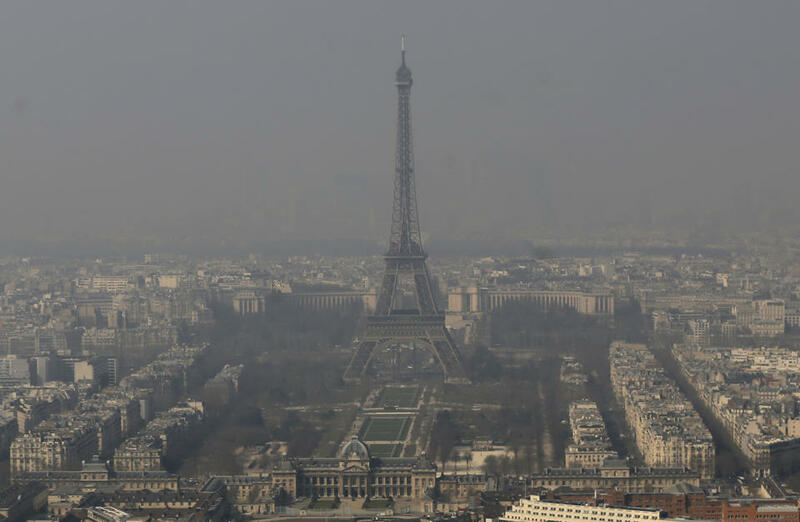 Nearly all of France was under some sort of pollution alert Friday, with levels in the Parisian region surpassing some of those in the world’s most notoriously polluted cities, including Beijing and Delhi. To combat the smog, public transit around Paris and in two other cities was free Friday through Sunday. The smog is particularly severe here because France has an unusually high number of diesel vehicles, whose nitrogen oxide fumes mix with ammonia from springtime fertilizers and form particulate ammonium nitrate. Pollutants from the burning of dead leaves and wood contribute as well. One environmental group complained earlier this week, denouncing the “inertia of the government,” saying it was putting lives in danger. There’s no question that pollution can be an immediate health hazard, especially for the very young and old and for anyone with respiratory or cardiac disorders, said European Environment Agency air quality manager Valentin Foltescu. “Some people will, unfortunately, die,” Foltescu said.